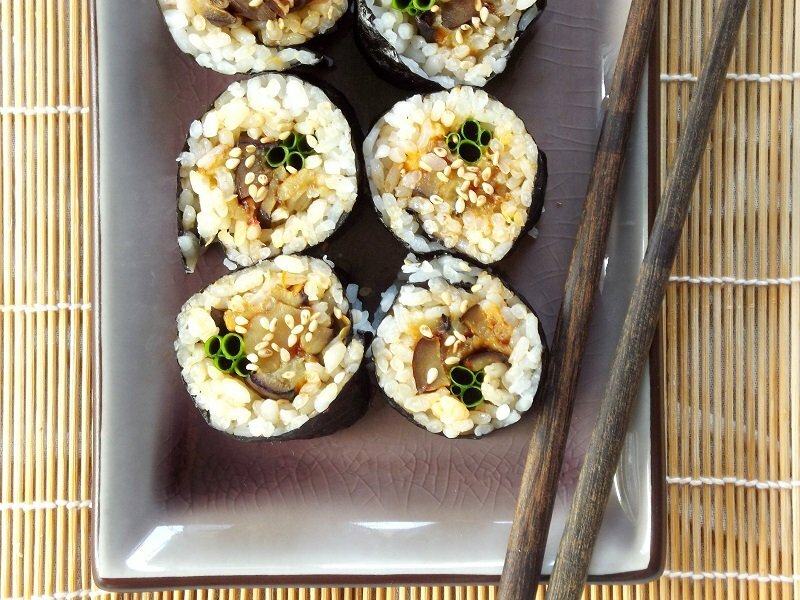 This spicy eggplant sushi is made with tender eggplant strips that are pan-fried in garlic and chili paste and rolled up with sushi rice and nori. So continues my unending quest to stuff every plant-based item of food in existence into a sushi roll. So far I haven’t gone wrong. For the last few weeks I’ve been able to harvest about an eggplant or two a week from the garden. Initially I wasn’t sure it was such a good idea to plant two eggplant plants, thinking I’d be overrun with eggplant, but now I’m glad I did. Those eggplants that go straight from the garden and into a recipe are by far the tastiest I’ve ever had. Whatever the case, these rolls are really tasty. I dined on them with my boyfriend, who, as I’ve mentioned on numerous occasions, isn’t a big fan of spicy. He loved these. Sniffled his way through the whole batch, and finished with a big “Wow! Delicious!” He also commented that this was about at the top of his spicy threshold, so for those of you that follow the Alissa’s boyfriend spicy food scale (which I recognize is becoming a thing), there you have it. Cut back on the chili paste as needed. Place rice in a strainer and rinse under cold, running water for 1-2 minutes. Place in a small saucepan with other rice ingredients, stir and heat to a simmer. Cover and allow to continue simmering for about 20 minutes, or until all liquid is absorbed. Place oil in medium skillet and over medium heat. Add garlic clove and chili paste. Sauté about 1 minute. Add eggplant strips in a single layer. Cook until tender and browned on each side, about 5 minutes per side. Cut about 1/3 of the length off of each nori sheet and discard or save for another recipe. Place one of your sheets on a bamboo mat. Keep a little bowl of water close by. Using wet hands, cover nori with a thin layer of rice. Arrange half of your eggplant in a single line along the width of nori, about one inch away from you. Arrange half of your scallion stalks alongside your eggplant strip. 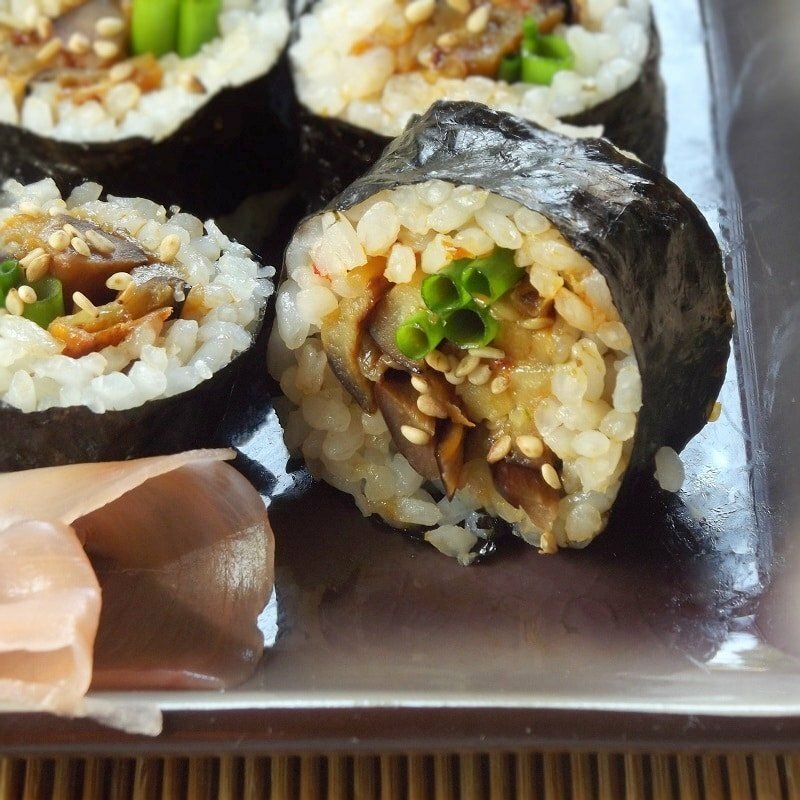 Take the bamboo mat and end of nori closest to you and tightly roll it over your filling. Tuck the end of the nori in and continue rolling, using the mat to press your roll tight. 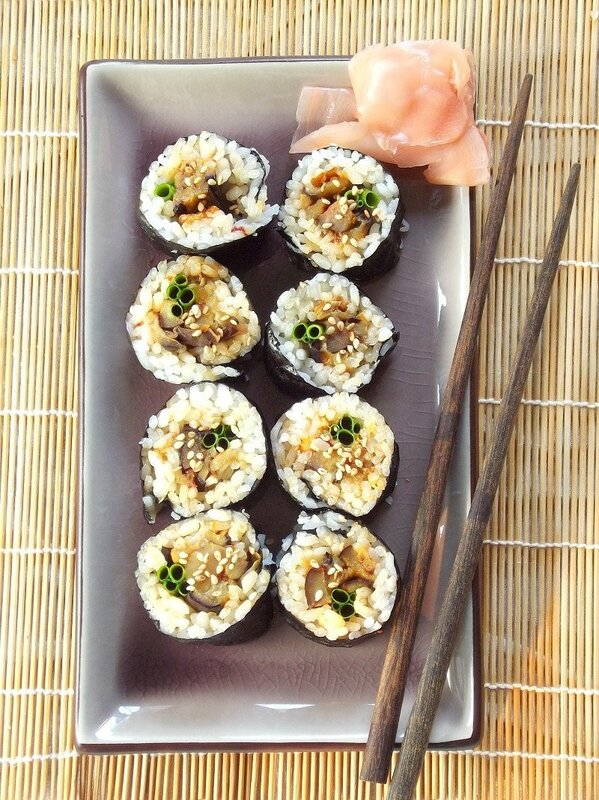 Once completely rolled, slice into eight pieces. Repeat using your other nori sheet and remaining rice and filling. Sprinkle with sesame seeds and serve with soy sauce or tamari, wasabi and pickled ginger. i have never had eggplant sushi before! seriously good idea.. will be trying it out next time i make sushi. love it! Maybe my S.O. would even eat eggplant like this! I am going to try it. We have a local sushi place, Midori’s in Minneapolis, that does does wonderful vegetable sushi. Sashimi of avocado, red pepper, asparagus! And a spicy roll with red pepper. I love that you can taste everything so cleanly, it really brings out the flavors, including the rice. That sounds wonderful! A few of the places in my area are starting to introduce more veggie rolls onto their menu. Tempura fried sweet potato roll has become a favorite. Good luck getting your S.O. to try this. I hope you both like it! How long do you think it would keep in the fridge if I made a bunch up at the weekend to take for packed lunches at uni? I’d say a day or two at the most, in a tightly sealed container. The rice tends to dry out, so the sooner you eat them, the better. I did end up sending some leftovers to work with my boyfriend though, and he said they were still good the second day. I hope you enjoy them! 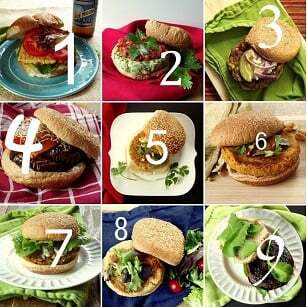 I’m totally making this! Why do you cut part of your nori sheets off though? I would cut down the salt to 1/4 tbsp, it was too salty when I made it.